The wide beach and large rock structures of Rockaway Beach on a hazy summer night. 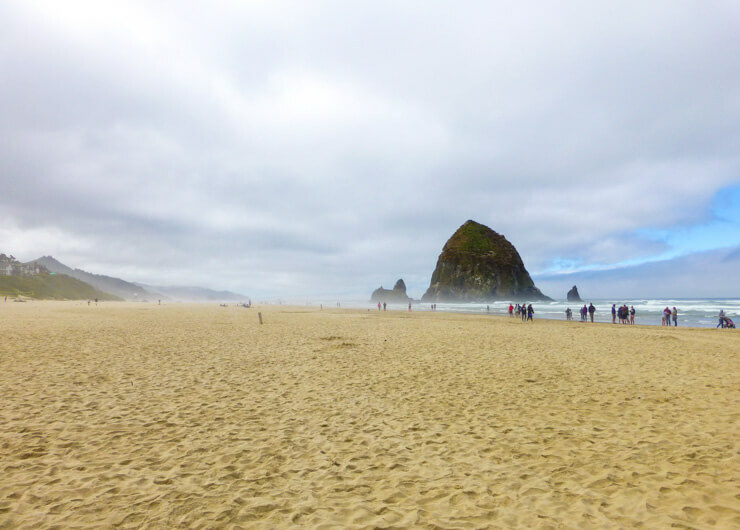 Even before we moved to the Pacific Northwest, I’d longed to visit the rugged coastline of Oregon, particularly Cannon Beach, home to the iconic Haystack Rock. 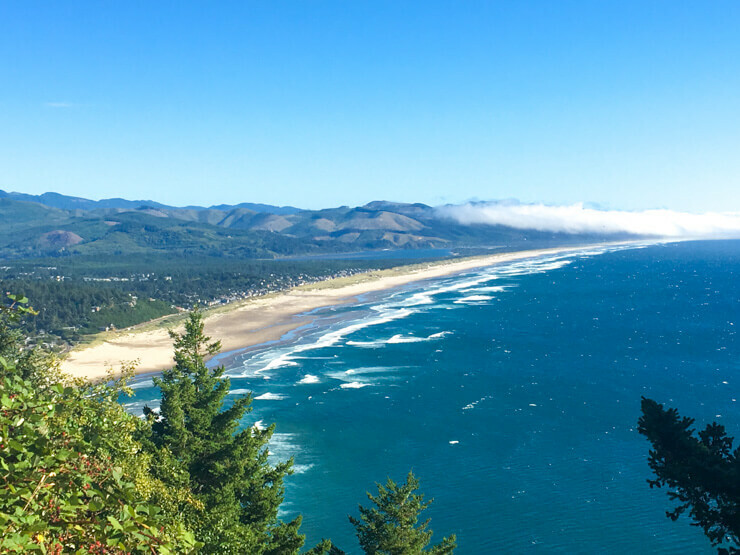 So it wasn’t long after moving to Washington that my husband and I began planning a summer trip to the Oregon coast. 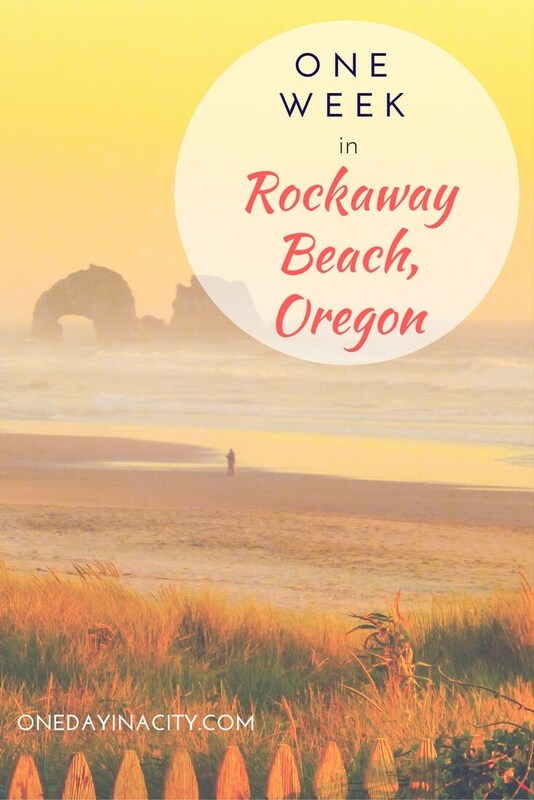 We figured we’d get accommodations in Cannon Beach, but ended up deciding on Rockaway Beach, a place we’d never heard of until we started researching. It ended up being the perfect choice for an Oregon beach vacation. 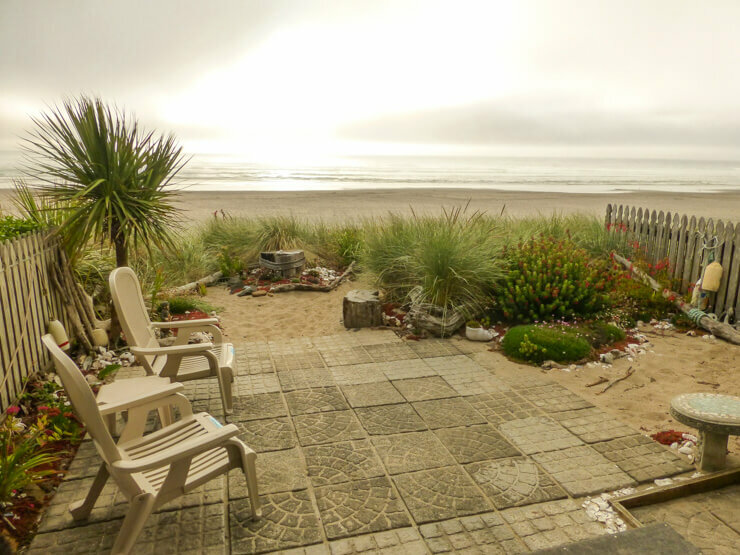 We chose Rockaway Beach because we could get a townhouse directly on the beach for the same price as a vacation rental a few blocks from the sand in Cannon Beach. 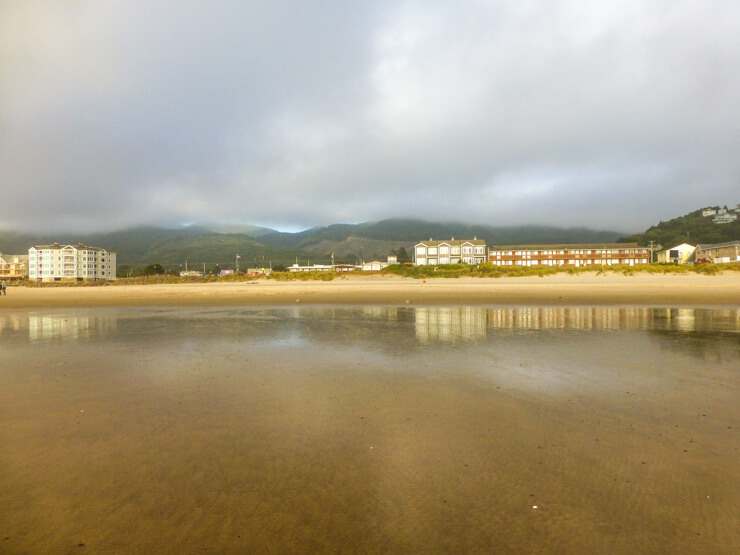 Rockaway Beach was also only 20 minutes south of Cannon Beach so we figured we could still spend time in that popular coastal town. Before booking our Rockaway Beach townhome on VRBO.com, I also emailed an acquaintance I met through a meetup group for local moms who I remembered posted some pics of Rockaway Beach on Facebook. She told me her in-laws had a place in Rockaway Beach and she and her family loved it there. She said it was much more laidback than Cannon Beach. Since we would be traveling with a young toddler, laidback sounded great to us. Turns out Rockaway Beach is about as sleepy of a beach town as they come. The restaurants and gift shops close before 7pm, and pretty much the entire downtown area can be walked in about five minutes. Our townhome was an easy two-minute stroll from the grocery store and other shops. 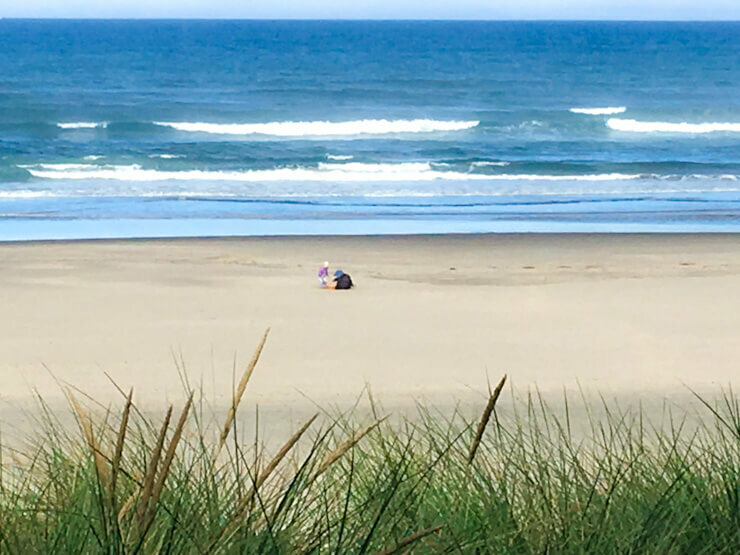 The beach was practically empty in the evening hours even at the height of the Oregon coastal tourism season. We didn’t mind this ghost town feeling at all. How could we with this evening view? After our daughter went to bed, we’d open a bottle of wine and enjoy the ocean views from the patio wrapped up in blankets before heading inside to play a board game or watch a movie. It felt exactly the way a relaxing family getaway to the beach should. The sandy shoreline of Rockaway Beach was also remarkably uncrowded during the day, but it was especially void of people in the evenings as I mentioned earlier. We’d go for walk along the ocean before the sun set and barely see anyone else. 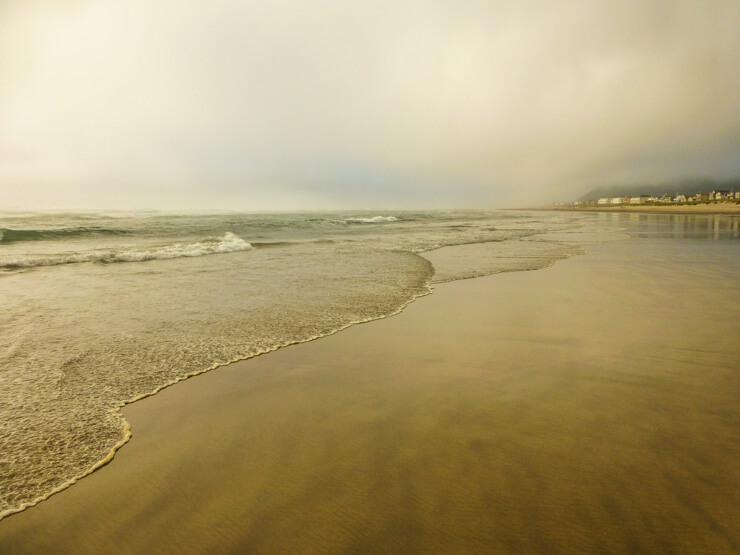 A lovely, empty Rockaway Beach at dusk, which felt even more magical on this hazy night (we had sunny, clear days and evenings the rest of the week!). Running along the peaceful beach. As much as we loved our little peace of PNW paradise in Rockaway Beach, we still ventured out a lot to explore. 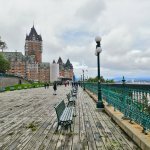 Here were some day trips we made before coming back to our oceanfront view. Note: This post contains affiliate links, which means I get a percentage of any purchases/bookings made through those links, which helps me cover the costs of running this site. Thanks for supporting One Day in a City! 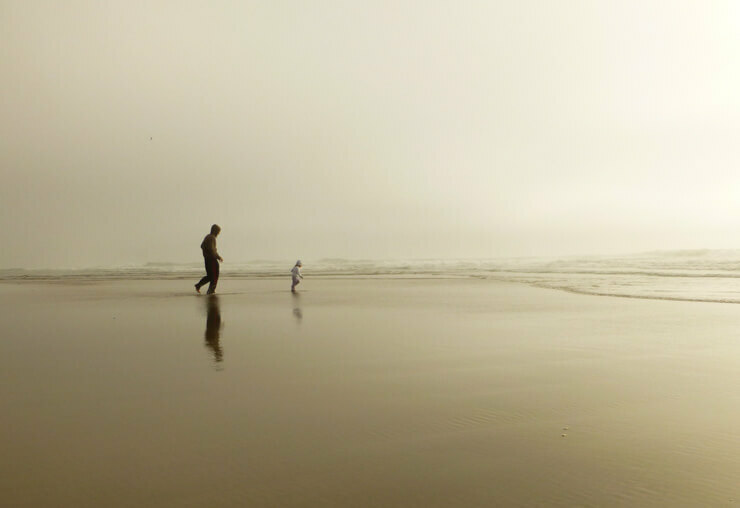 We got up early and headed to Cannon Beach one morning to try and beat the crowds. It sort of worked. The beach definitely had people on it, but not a ton. 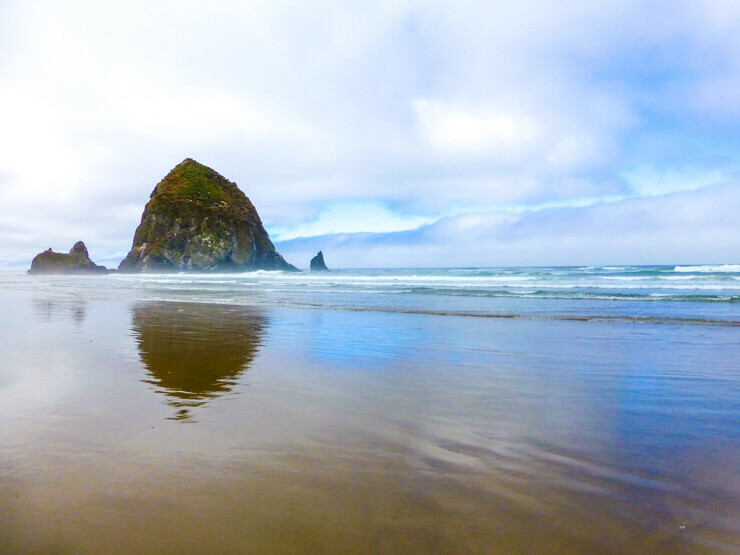 I was actually able to get pictures of Haystack Rock without anybody in it! But once we finished breakfast and walking along the beach to head into town, the main streets were bustling with tourists. Speaking of breakfast, before walking along the beach, we dined at Wayfarer Restaurant. 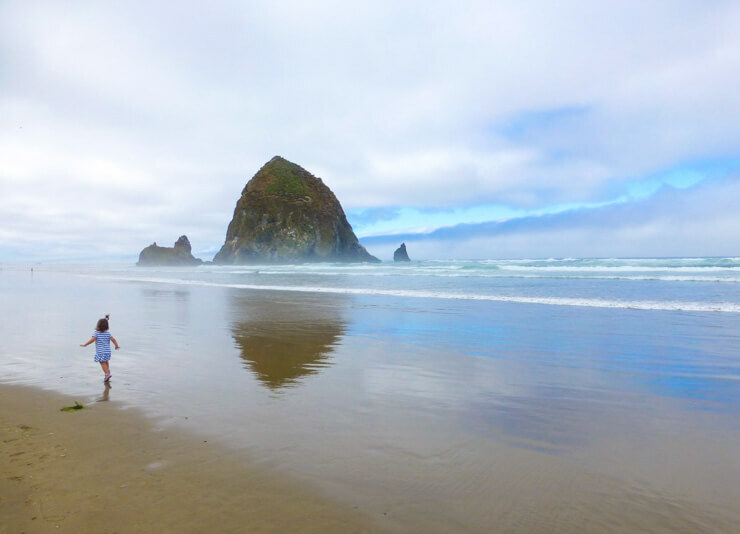 It was kid-friendly and had delicious breakfast entrees plus a large picture window view of Haystack Rock from the dining room. After breakfast it was time to hit the beach. We didn’t lounge on the beach, instead we just went for a long walk (or in my daughter’s case – crazy running and laughing up and down the shoreline) and enjoyed the views. 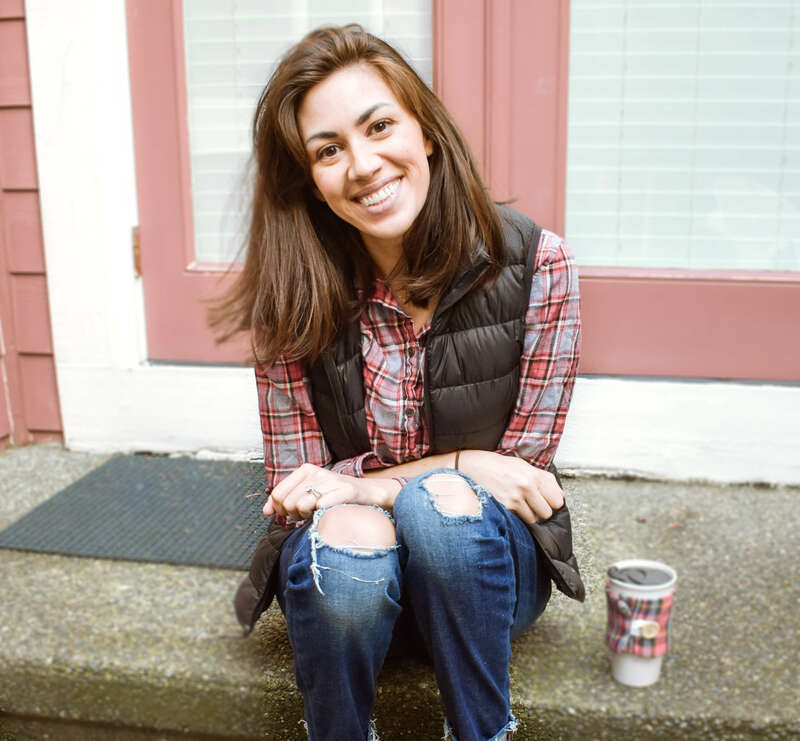 In town, we popped into gift shops and admired Cannon Beach’s cute little tree-lined side streets. Since the streets and shops were already pretty crowded and we aren’t huge shoppers it wasn’t long before we were looking for a respite so we tucked into the Wine Shack, a local wine shop (on the left in the picture above), for a bit of wine tasting. The person pouring our wine was knowledgeable and really tried to help us find a Syrah we would like as we wanted some to go with some steak we were planning to cook. We got a bottle of Syrah and a couple other bottles to enjoy back at our townhouse during our week in Rockaway Beach. 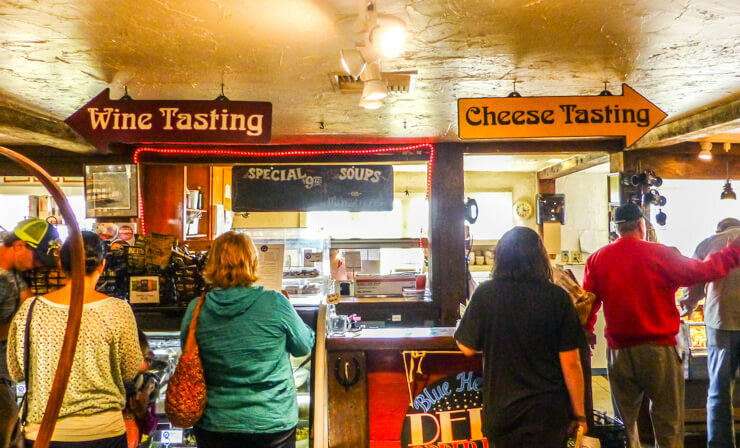 We spent an afternoon in the city of Tillamook and our entire time there was basically spent taking part in gastronomic delights. First we went to the Tillamook Cheese Factory to sample some cheese and see how it’s made. It’s a cool place since you can actually watch the factory and cheese-making and packaging process in action through large windows from above. While the cheese is tasty, the real highlight is getting fresh Tillamook ice cream. They have an ice cream store upstairs and downstairs with a ton of different flavors. We grabbed some ice cream at the upstairs ice cream counter since the line seemed shorter and then took it downstairs to enjoy at one of the many tables in the cafeteria. 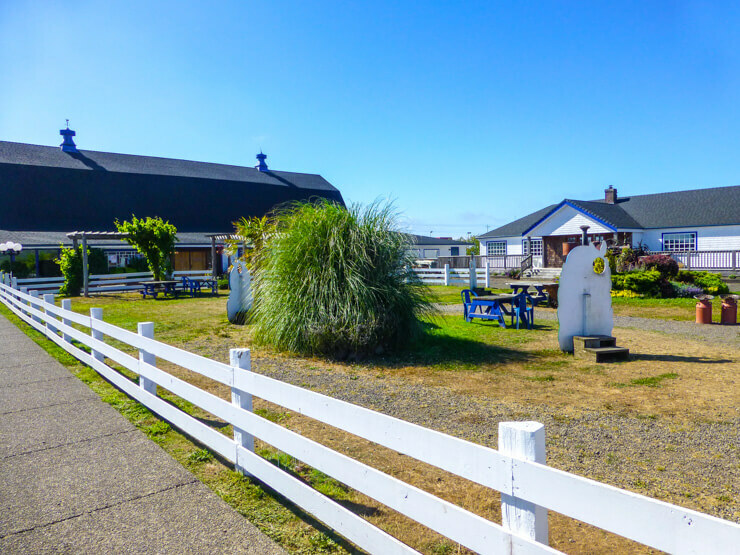 Our favorite place in Tillamook, though, was Blue Heron French Cheese Factory. 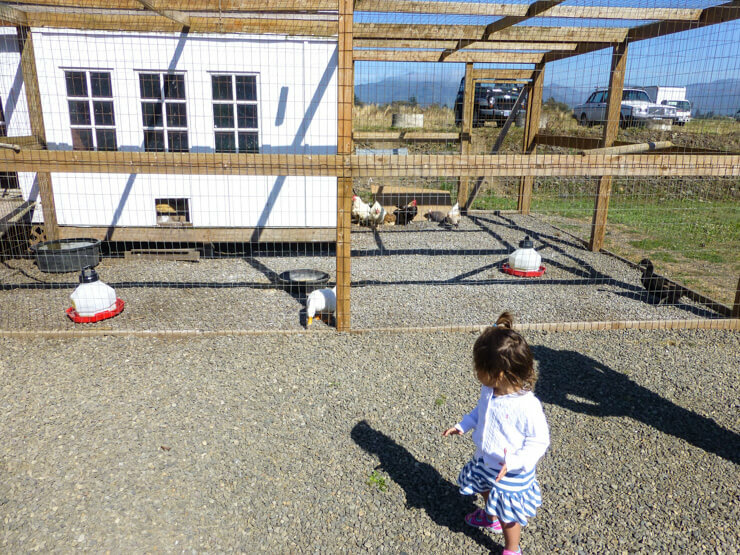 This was a perfect stop for families as it had wine and cheese tasting plus a gourmet food shop for the adults and farm animals for the kids. The grounds of Blue Heron French Cheese Company. We left wishing there was something like it closer to where we lived because all of us both big and small had a blast. Blue Heron also has sandwiches and salads you can order so we had a late lunch at Blue Heron while enjoying our wine tasting. 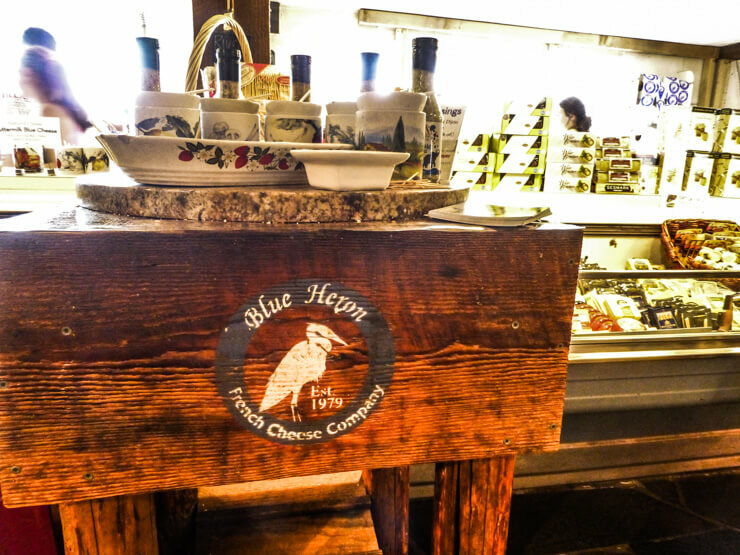 Wine and Cheese Tasting at Blue Heron French Cheese Factory. Our table for lunch was located right next to here across from the wine tasting counter. 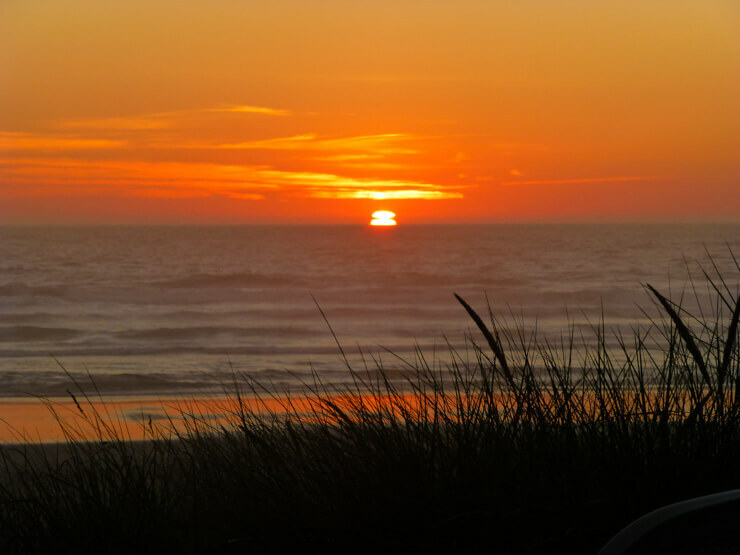 Tillamook is located in the same county as Rockaway Beach (Tillamook County) and takes about 25 minutes to drive to from Rockaway Beach. 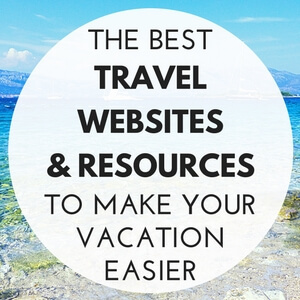 Quick break from the itinerary to call out a few things you should pack. You probably know to bring a swimsuit and good walking shoes, but here are some other items you won’t want to forget. Or a cozy blanket poncho like this one for cool nights. You’ll be glad you have one if you want to swim in the ocean. There’s no shade at Rockaway Beach — this beach umbrella that also looks kind of like a half tent is really cool! The drive itself down to Rockaway Beach from Seattle was quite scenic (just look at that photo above of the coastline!) but we had to do at least one dedicated scenic drive in Tillamook County while we were there. We decided on doing the Cape Meares part of the Three Capes Drive, which took us past gorgeous coastal views, including Three Arch Rocks. Netarts Bay along the drive was especially lovely and made both my husband and me note that it may be a place to check out to stay for a future trip. 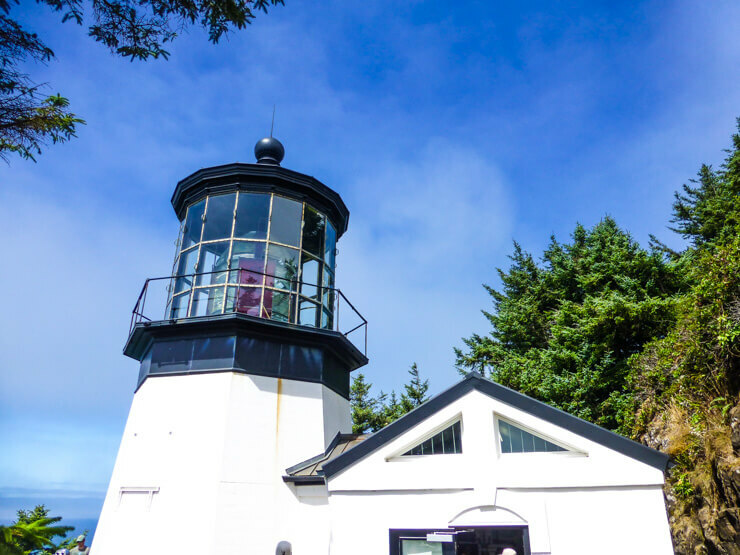 The drive also takes you to a cute little lighthouse located on Cape Meares from which you can take in more stunning views of the Pacific Ocean. 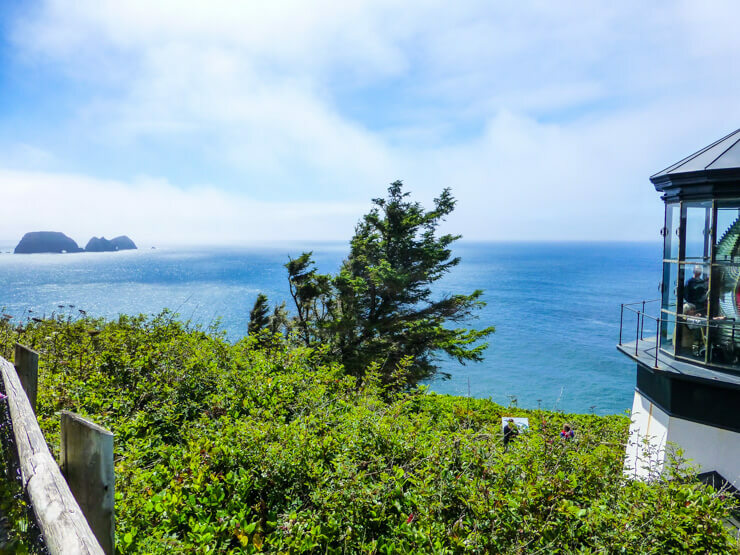 Beautiful ocean views from Cape Meares Lighthouse. 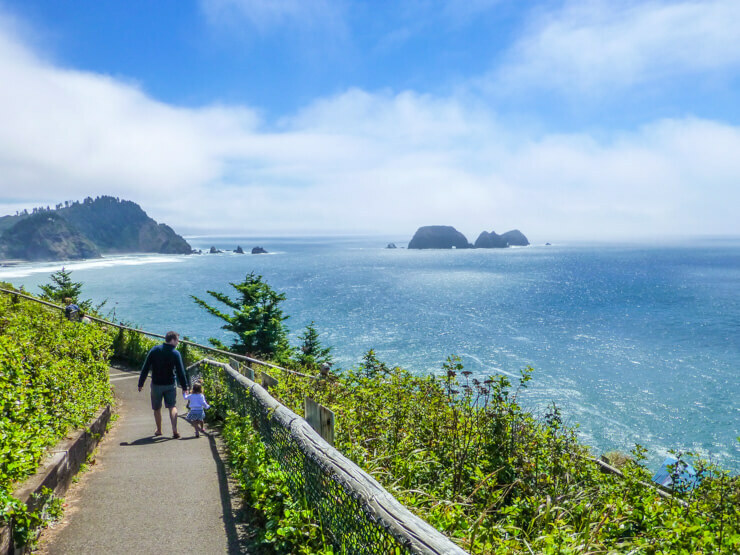 Walking along the scenic coastline trail leading from Cape Meares Lighthouse. 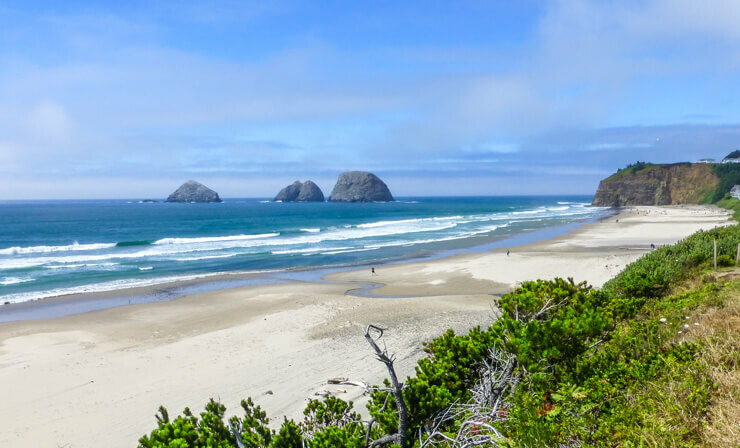 The entire drive goes down to Pacific City through Cape Kiwanda and Cape Lookout in addition to Cape Meares, but we skipped the southern two capes and cut back inland along the 131 to Tillamook before making our way back north to Rockaway Beach. When we weren’t doing those day trips we were hanging out at Rockaway Beach playing in the sand and the waves. 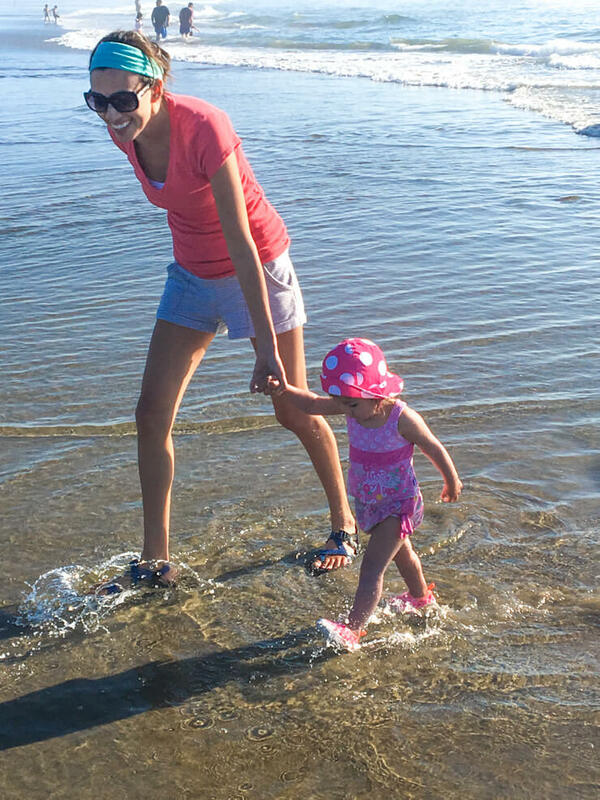 My husband and I thought the water was freezing, but maybe a decade living in southern California with its warm ocean in the summer spoiled us — our daughter had no problem running through it all day! 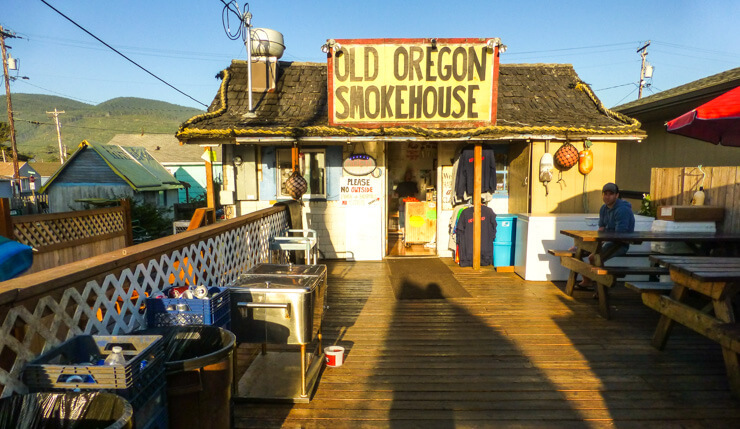 Old Oregon Smokehouse definitely stands out along the little main street of Rockaway Beach thanks to its long deck of picnic tables and old sea shack exterior. We’d heard great things about it so were excited to try the cuisine from this little hole in the wall restaurant. We ordered the crab cakes made with local crabs and the fish and chips sandwich, and for being such simple entrees, both were memorably delicious. The crab cakes were juicy and chock full of huge pieces of crab — the breading mix was just the accent for the crab instead of overpowering it. The fish and chips tasted fresh and paired ideally with a tangy tartar sauce. 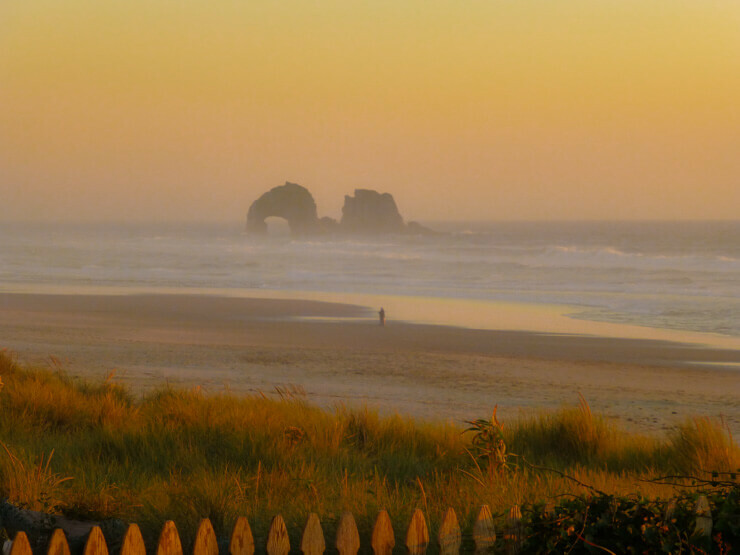 The area of Oregon’s coast along where Rockaway Beach is located is a prime oyster spot. 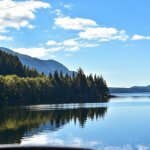 You can even catch your own, but we weren’t sure about oyster hunting with a young toddler in tow, so we drove down to the town of Garibaldi and visited Garibaldi Cannery, which is located in an industrial looking building right next to the harbor. We got fresh oysters and live crabs caught that morning. 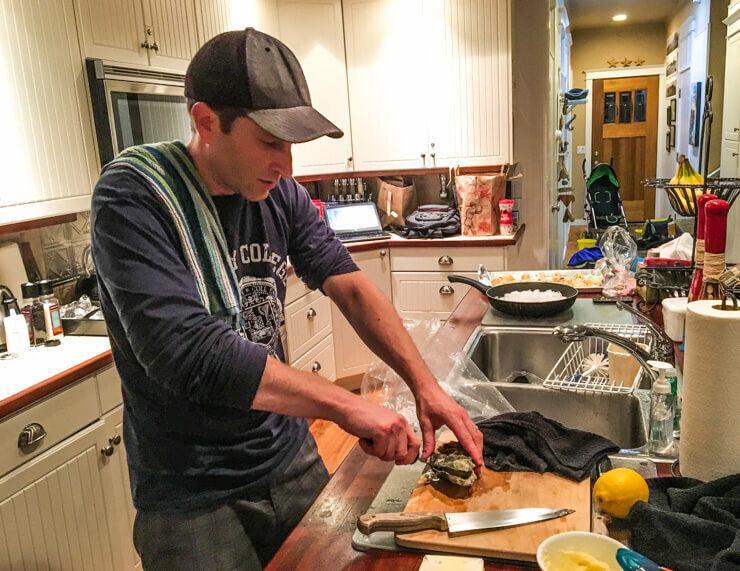 When we got back to our vacation rental, Tom began preparing our seafood feast after our daughter went to bed. Our oyster appetizer turned out to be quite complicated even with the oyster knife Tom purchased from the seafood shop. Raw oysters are not easy to open! After YouTubing and reading through demos (which pretty much all make it clear it’s VERY possible to stab your hand in the oyster opening process — there are even gloves to help eliminate this risk), Tom finally figured it out with no injuries, but not without me covering my eyes in anticipation of a bloody hand. Trying to figure out how to open an oyster without impaling one’s hand. Oyster success! These oysters were HUGE. I also went upstairs when it was time to cook the live crabs (which the shop had put on ice in a cooler since apparently that’s a more humane way to cook them). Apparently I am a wimp when it comes to preparing seafood. But I sure did enjoy eating it! We cooked at our vacation home a lot, but also got takeout one night from Offshore Grill, which was just a block down the street from where we were staying. The food wasn’t as memorably delicious as Old Oregon Smokehouse, but it it was still quite good and satisfying. It was also fun to try the Pan Roasted Rockfish entree on its menu, which was a fish I hadn’t tried before. There’s a cute little candy and ice cream shop called the Picnic Basket along main street in Rockaway Beach with heaps of dozens of different flavors of toffee displayed inside. The citrus flavors of toffee were sweet, chewy pieces of deliciousness and reminded me of Starbursts (one of my favorite candies), only better. 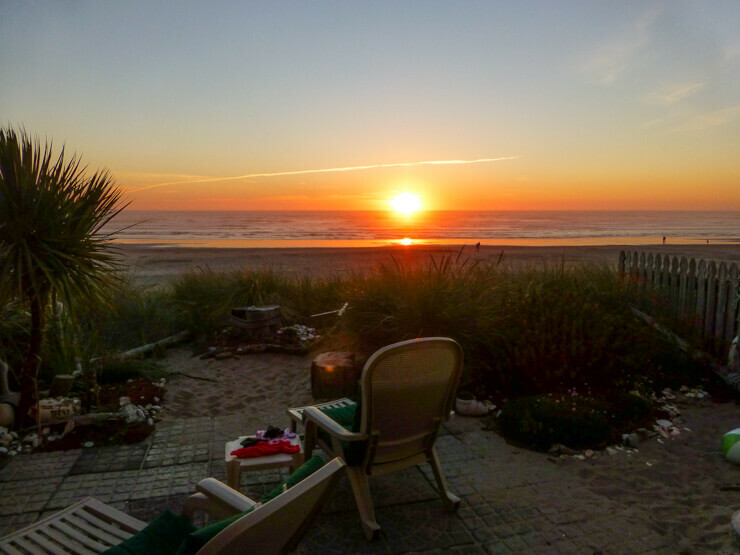 Rockaway Beach has many vacation rental options. 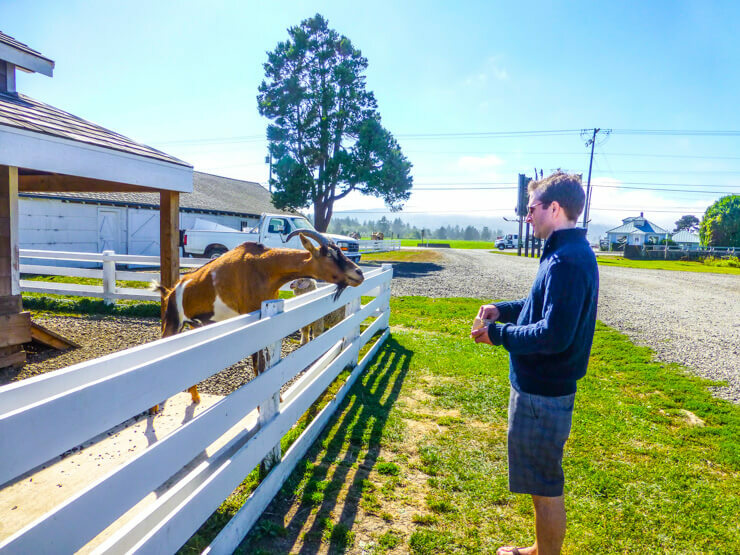 We booked a place that was listed through a fairly prominent property rental company in this area of Oregon, which made it pretty easy to talk with them about some questions we had about the property and felt comfortable everything would be as expected when we arrived. 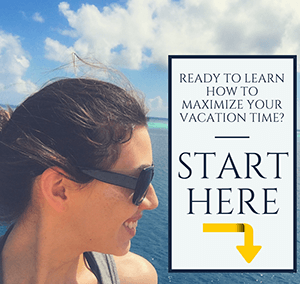 You may also enjoy reading this post I wrote about how I prefer to book vacation rentals and some of my tips for doing so. 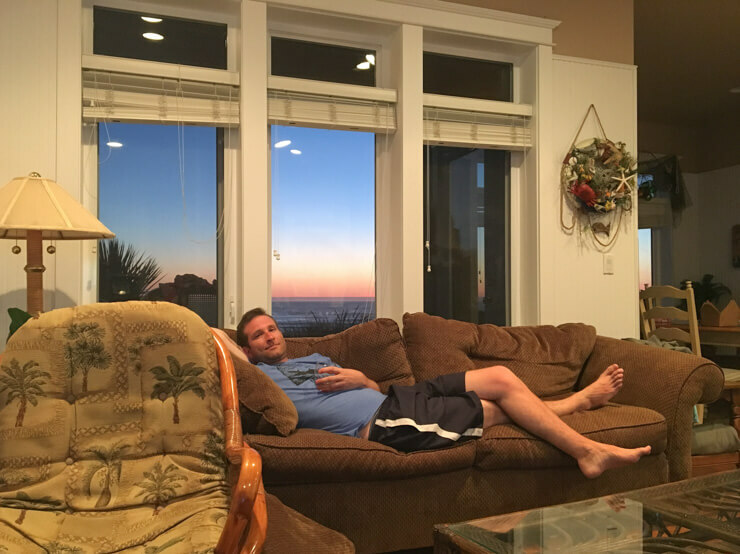 Lounging in comfort in our vacation rental — look at those ocean and sunset views through the window! We LOVED the townhome we found. It had ocean views from the living room, kitchen, and master bedroom, plus a relaxing patio that had its own little trail straight down to the sand. 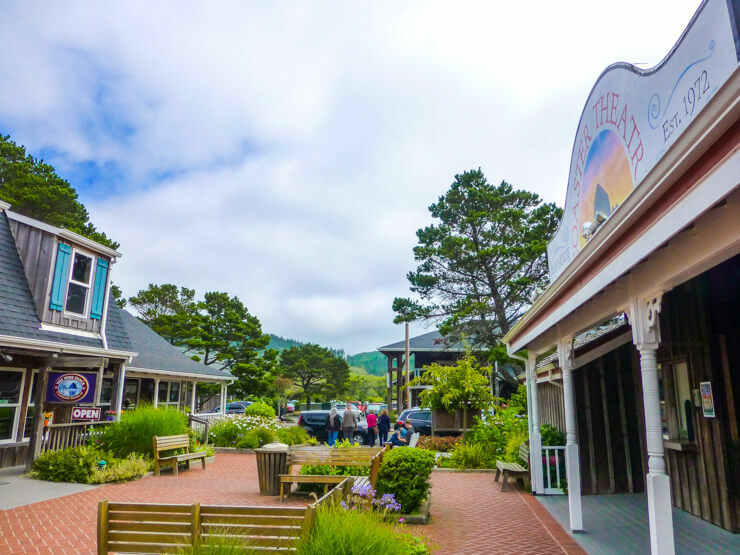 It was also just a couple minutes walk to the main street area of Rockaway Beach where the grocery store, shops, and restaurants are located. The patio of the townhome we rented through VRBO. 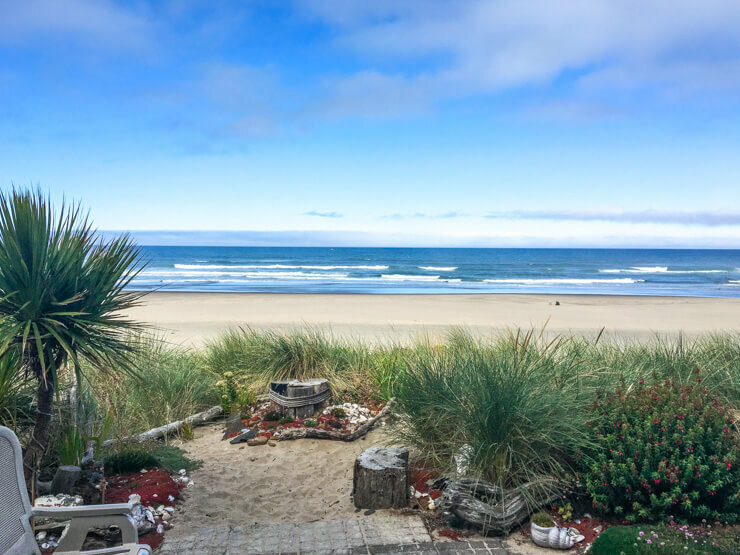 It was a no brainer for us to get a vacation rental since we were traveling with a toddler and knew we needed the extra space and kitchen amenities, but there are also a few hotels in Rockaway Beach if you’d rather go that route. Some hotels (and vacation rentals) along the Rockaway Beach coastline. Beach Stay Motel: Affordable with minimal frills, but still has charm and is just a couple blocks from the beach. Click here to see pictures and prices for Beach Stay Motel. Surfside Resort: Rockaway Beach doesn’t have a true luxury hotel, but Surfside Resort may be as close as you’re going to get with its oceanfront location that is slightly elevated meaning room options with gorgeous panoramic beach views and a spacious indoor pool. Click here to see pictures and prices for Surfside Resort. Silver Sands: This oceanfront hotel boasts easy access to the beach, an indoor pool, select rooms that have a kitchenette, and patio rooms on the bottom floor that open almost straight onto the sand. Click here to see pictures and prices for Silver Sands. Old train depot and main street in Rockaway Beach. Rent a place with an equipped kitchen (or at least a fridge if staying in a hotel) since there aren’t many dining places open late for dinner. Even Old Oregon Smokehouse is only open until 7pm most nights. 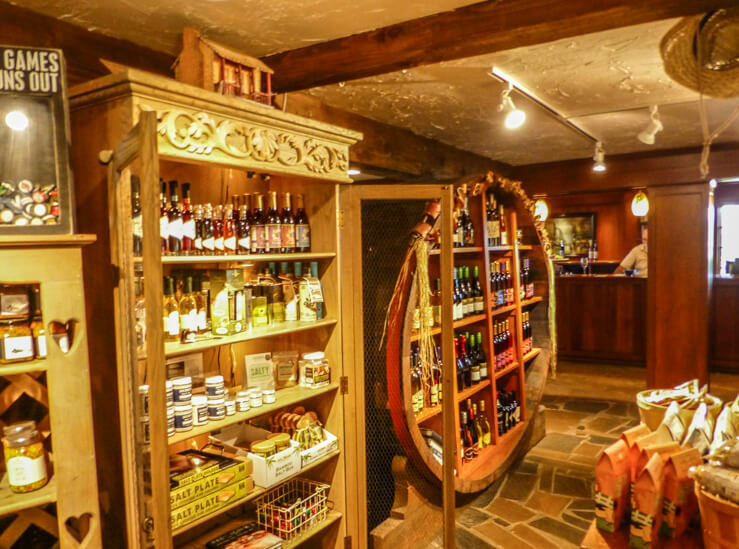 If staying in a vacation rental, stop at a grocery store on your way into town to stock up on food for the week. Bring an oyster tool. 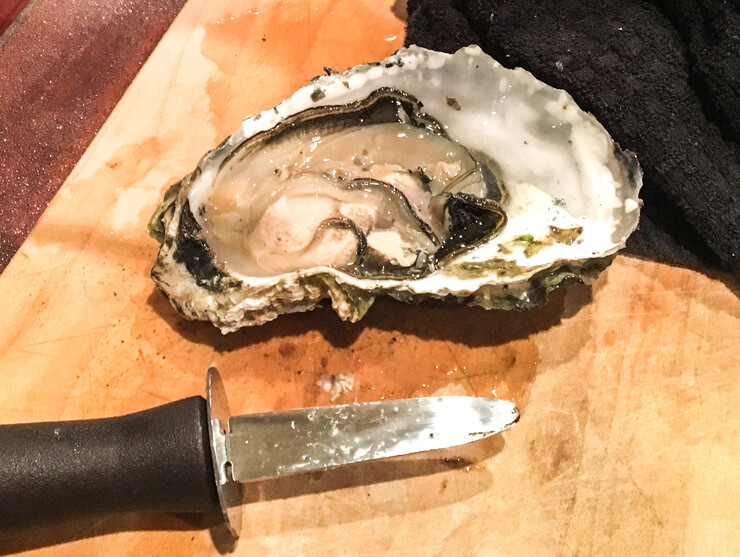 And YouTube how to open a raw oyster if you’ve never done it before – it’s not so easy! Bring warm clothes even in the summer. It gets cold at night. Also, the wind can have a chill to it even during the day so dress accordingly. 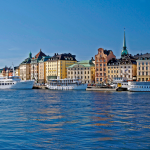 Book your accommodations early (like at least six months early) if traveling in July or August. Accommodations book up early and fast since most Pacific Northwest residents travel to the coast during these months, plus other visitors from around the world. If you want to go in the ocean, pack a wetsuit. The water is still painfully cold even in the summer months. Found this post helpful? 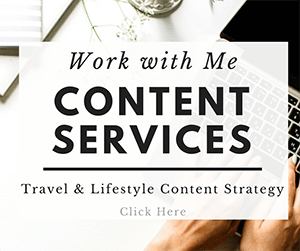 I’d love it if you shared it on Pinterest (plus then you’ll have it pinned to read later when planning your vacation)! Rockaway beach is such a fun place. We just spent a week there for a family reunion and loved it. My little man loved playing in the ocean even though the water was freezing!